Woods Hill Table – Love.Yarn.Shop. 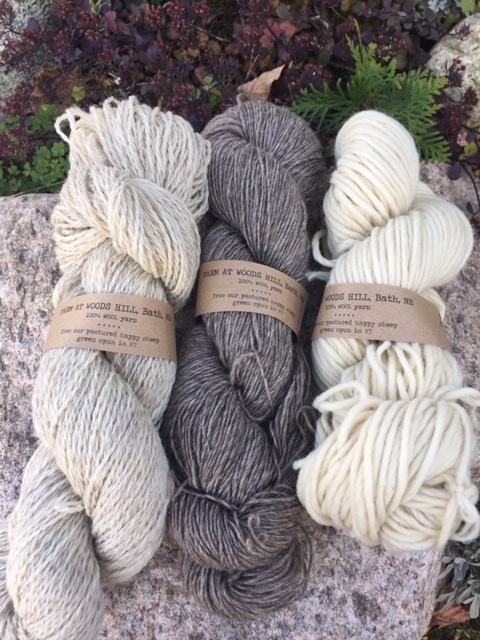 This past Monday, I travelled into the hills of Bath, New Hampshire, to pick up yarn for the upcoming Yarn Tasting. The Farm at Woods Hill sits on over 260 acres of rolling hills with a stately farmhouse that sleeps 20, a huge barn that was relocated from Lang Farm, an open-plan lodge, and then all the animals–cows, chickens, ducks, pigs,–and, of course, sheep. The farm produces the meat and vegetables, honey and jam, for Woods Hill Table in Concord, Massachusetts. The owner is Kristin Canty, the filmmaker who produced Farmmagedon – The Unseen War on American Family Farms. Our guide was Chelsea, who graciously drove us around in a Wrangler to see the sheep and pigs, and guided us through the rooms of the farmhouse, with 18-inch planked floors, and sumptuous carpets, ending upstairs in the high-roofed attic at the top of the house which is used as a yoga studio. Check out their websites and come check out their yarn on Friday the 12th from 5-7.